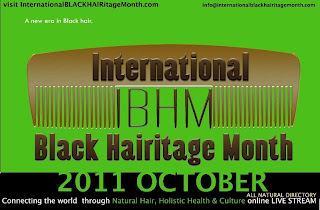 October was an incredibly jam-packed month as you know, being both Black History Month but also the first year of International Black Hairitage Month (IBHM). 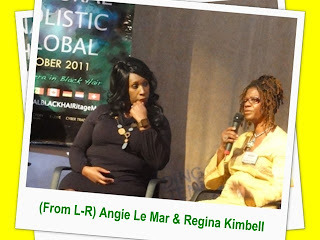 As you can tell from my most recent posts there have been some fantastic events for UK naturals, so many in fact that I had to devise the United KinKdom Events Page (Click Here or above.) Before officially waving goodbye to the British Summer time, there was time to fit in just one more. 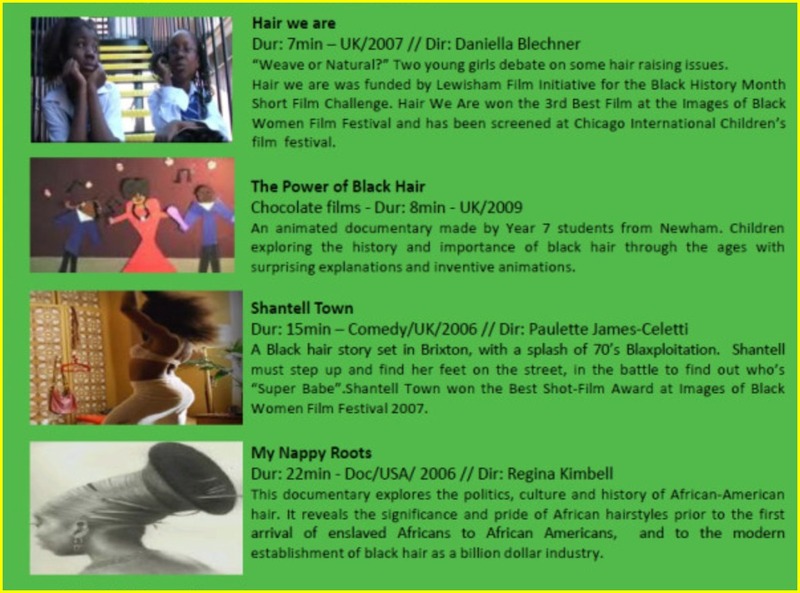 Since going natural I've been to exhibitons, read books, listened to poetry and seen theatrical performances, but until the Black Hair Film Series, I had yet to hear about any British films addressing the subject of natural hair. 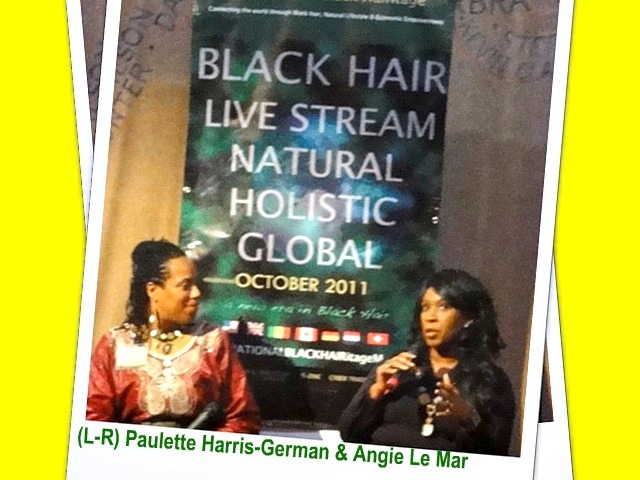 The Black Hair Film Series (an event produced by Regina Kimbell, Founder of International Black Hairitage Month - IBHM and Sylviane Rano, Director of the Images of Black Women Film Festival - IBW) was a screening of 5 short films, each addressing the topic of Black hair, and followed by a panel discussion with Margot Rodway-Brown and Rudi Page, two of Britain's leading Entrepreneurs in the field of Black Hair & Beauty, as well as British Actress & Comedian Angie Le Mar and American Film Director and Founder of IBHM Regina Kimbell. 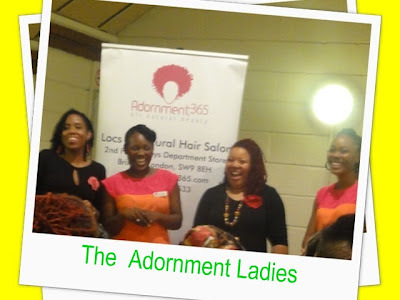 There was also the opportunity to take part in a health and beauty workshop delivered by the team of Adornment 365 Hair Salon. 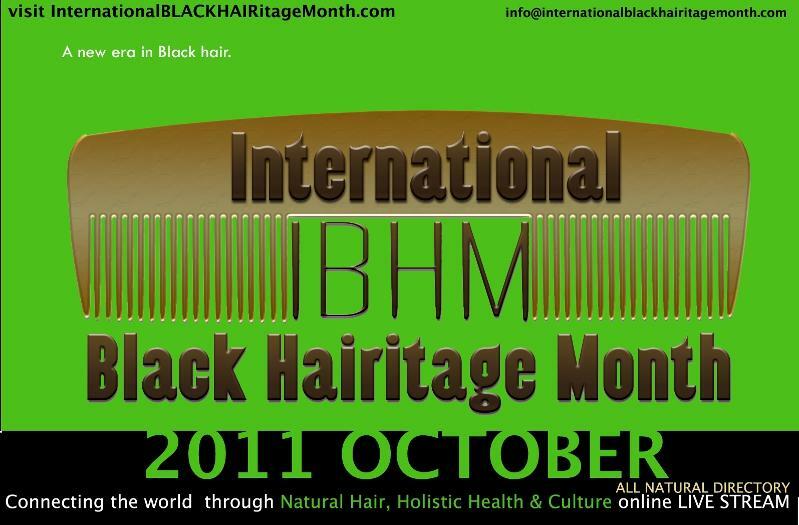 It was such an eye-opener to me to discover that there were Black British Filmmakers, addressing the subject of hair. Each one had a unique and entertaining approach and it would be great to see some of the works developed even further. 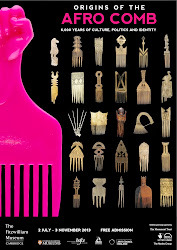 In fact just to know that this type works is being produced can be hugely inspiring to others like myself who enjoy combining both a passion for the arts and a passion for natural hair. The first two films starred children as the narrators. 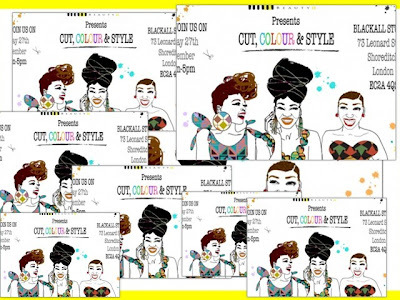 In Hair We Are, two girls rhyme their way through various issues such as styling options, and beauty ideals, while The Power of Black Hair, made by year 7 students is a documentary supported by some very comical animations, which explore the history of Black hair. The third film The Hair Story, starred some very well known Black British performers including Judith Jacobs and Janet Kay and turned out to be a brilliantly funny production by the BiBi Crew. 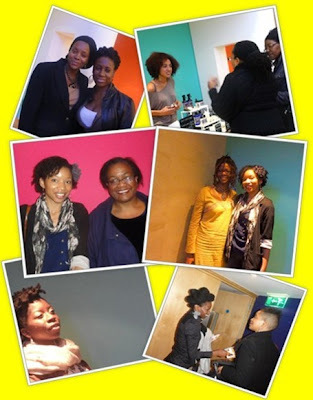 It was brilliant to know that these women who are the trailblazers and inspirations for the generation of Black British females below them, are continuing in their work and haven't forgotten us, as there's no way we could forget them. I was so excited to discover that these very women were sat in the audience just a few rows behind me, in support of the event. 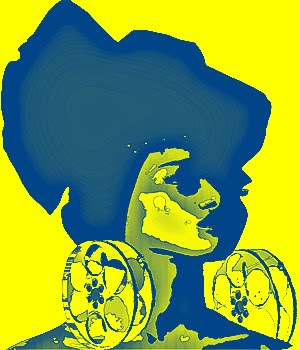 In the last of the British made films, Shantelle Town, it was fun to see a the Brixton based, Blaxplotation inspired movie where after a hilarious dance-off, the natural haired heroine gets the guy. 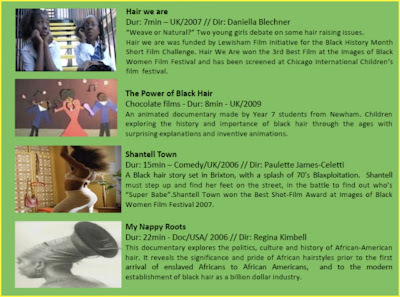 The screening was concluded with the shortened version of My Nappy Roots, which is a brilliant taster of what to expect from the full length version, that I previously reviewed as part of Respect The Fro pt2 (Click Here!). Similarly to many other women with natural hair, I feel there is a need for increased representation of our image (You guys must know my favourite quote by now), which is why artistic platforms such as exhibitions, theatre and of course film are a brilliant places for us to state our presence. 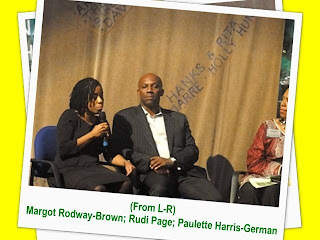 After a brief interval the panel took to the stage for the debate, hosted by Co-Organiser Paulette Harris-German. 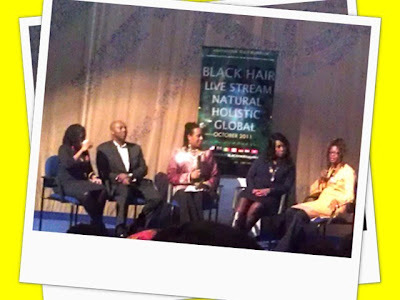 The debate was a perfect example of the how beneficial Regina's work of founding International Black Haritage Month, can be and already is, as the panel discussed the various ways in which hair had effected the experience of Black Britons. As one member of the panel stated, hair is an important part of our "cultural language", thus making IBHM a brilliant opportunity for us to re-communicate across the globe. 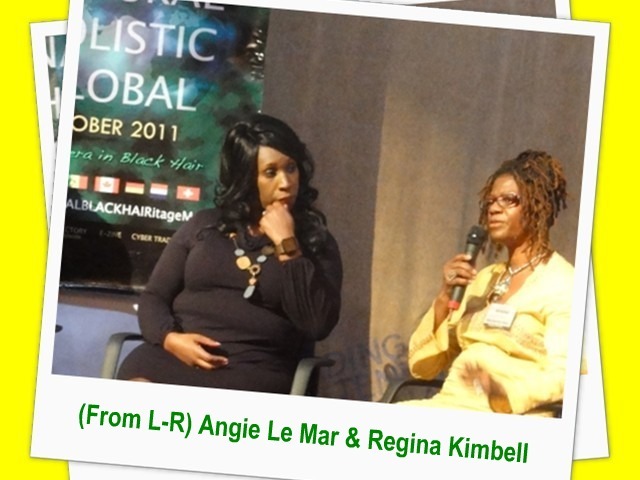 Margot, Founder of Adornment (The Expo) and Adornment 365 (the Salon), and Rudi, who helped to establish the first Afro Hair & Beauty Show, revealed some of the incredibly shocking challenges encountered by Black British businesses in the Hair and Beauty industry. 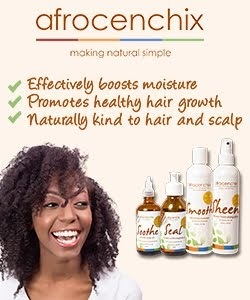 To discover that pioneers such as Dyke & Dryden were achieving a financial turnover of 1 million pounds (£1,000,000) in the early 80's, yet were denied an overdraft of 5 thousand pounds (£5,000), was outrageous; as were the tales of shops who refused to stock Black hair products, for fear of encouraging thieves. It makes you wonder if this generation of young Black women who can now spot the odd Black Hair product in Boots, realise just how far we've come. However it could be argued that if 1 lonely shelf of Dark & Lovely and Organic Root Stimulator counts as progress, we still have a long way to go. Both Margot and Angie, raised some particularly important points stating the necessity of recognising that we all have a voice, and a duty to make sure its heard, so if we feel we're under represented we need to say so. Furthermore, I completely agreed with Margot's observations about the power of young women today, who as comsumers and trend-setters, are increasingly displacing the gate-keepers of what's hot and what's not. Consequently "we" effectively have the ability to make or break the industry as we like. Congratulations to the all the Organisers including Paulette Harris-German, Regina Kimbell, and Sylviane Rano. 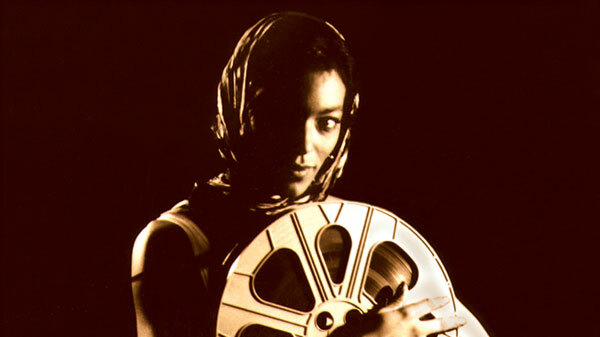 I hope The Black Hair Film Series is the first of many. 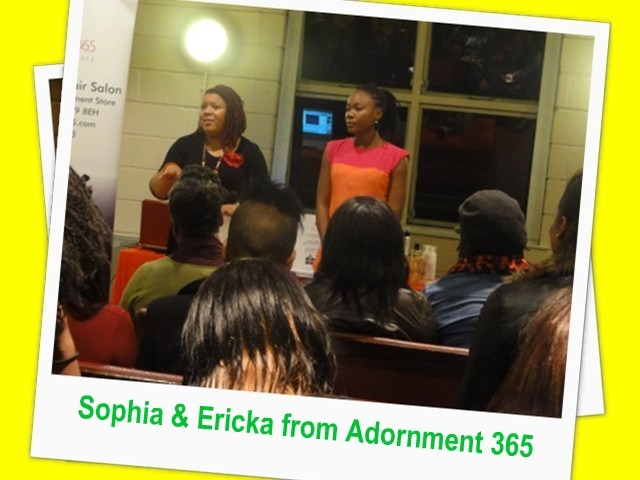 The day was fantastically priced at just £7, but there was also the opportunity to take part in a £5 workshop from the team of Adornment 365, following the debate. Before making my way to the workshop there was enough time to say a few "hellos" to some of the other audience members, many of whom it was lovely to catch up with again, and others who it was lovely meet. 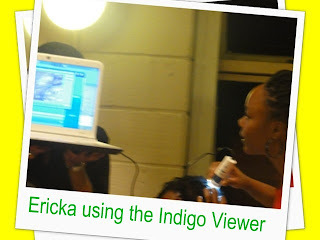 Simply put, the workshop was beyond interesting! It was not what I was expecting but it was Excellent, and I've been raving to my friends about it since. 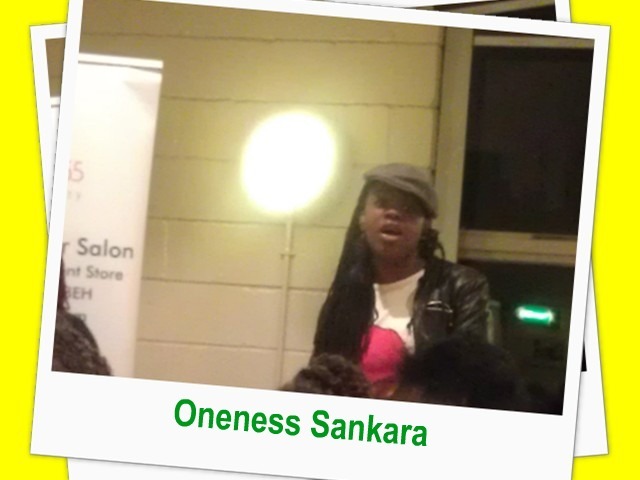 Before it began we were treated to a performance from Singer/ Spoken Word Artist Oneness Sankara. The first half of the workshop was presented by Salon Manager Sophia, who spoke about naturopathy and general health, whilst the second half was presented by Chemical Engineer Ericka, who discussed what ingredients to look out for when buying products for your hair. There was so much brilliant information from both parts of the workshop that it was hard to keep up, so I've shared a few highlights from the notes I took below (disclaimer). Im sure after taking a glimpse, you'll be as glad as I was to find out that Adornment actually holds workshops that that you can book places for. 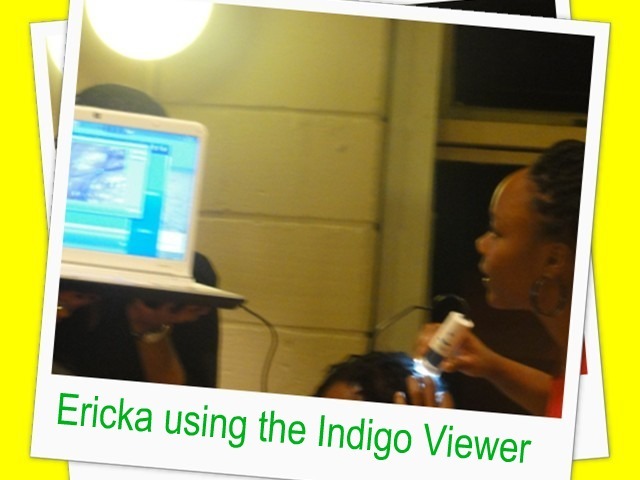 The ladies also showed us how they are able to achieve detailed scalp analysis using the Indigo Viewer - a camera with a magnifying strength of 200%. For more information on the workshops or consultations, contact the Adornment Team here: Adornment 365 on Facebook. Remember to check out THE COMPLETE PHOTO ALBUM from The Black Hair Film Series on: The Crystal Afro Facebook Page. 1.) The body treats food as any other form of external matter i.e a foreign body, and thus tries to break it down. 2.) Water is incredibly important, not just for cleansing the system but also for your body to be able to breakdown food it needs sufficient amounts of water, i.e 2ltrs or 8 - 10 glasses of water per day. 3) Try a cup of hot water with a little tip of Cajun Pepper & Olive Oil added for breakfast. 4) Water intake is very important during pregnancy, as baby eczema is an indication of dehydration when in womb. 5) Water is important to help keep your internal PH balanced, and avoid acidity. When your stressed your PH is Acidic, which effects your body's ability to absorb nutrients, and makes it more susceptible to illness. 6) Check out the book - Hidden Messages In Water. 7) Ferritin levels in the blood should be at approximately 80 for healthy hair growth. 8) Essential oils are essential because the body cannot produce them. 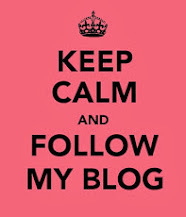 9) Cod Liver Oil is very good for you and preferably taken before meals - NOTE: OILS CAN BE PURCHASED AT ADORNMENT!! 10) A craving for crunchy foods can indicate frustration, while a craving for creamy foods can be an indication of needing affection/ love - its good to have at least 12 hugs a day. 11) Sleep is very important as organs have peak recovery times (and if I remember rightly) the scalps is between 1am - 3am. 12) The first 5 ingredients of a product tell you about its make up. 13) The first 5 ingredients usually consist of Water, Oil, Emulsifier, Humectant, Emollient. 14) The ingredients after the first 5 are often preservatives, or give colour, or smell. 15) Parabens are synthetic preservatives with debatable effects on health. 16) Detergents such as Sodium Lauryl Sulphate (SLS) can contain Nitrogen which can cause harmful reactions. 17) Ingredients that end in 'one such as Dimethicone or Cyclomethicone, are known as Silicones. 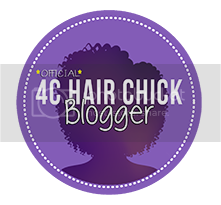 These help give the illusion of healthy hair by making it look and feel smooth and shiny, however they can actually seal out the moisture and clog follicles, which actually leaves hair dry and effects hair health. 18) Grey hairs grow quicker and stronger than other hair. 19.) Natural Oils are good because they have a similar structure to oil we naturally produce from our heads. 20) Avoid a regime containing Shampoos with SLS, and conditioners with Silicones, as you are likely to end up with dry brittle and unhealthy hair, that is temporarily disguised.